It is clear in this Era of Technology and progress that Education plays vital role in progress and development of a country and nation. It wouldn’t be wrong if we classify the education system as the cornerstone of the future progress of any nation. As Pakistan is an under developed country, Education is Extremely important for its Children and youngsters as well. We are watching that standard of Education system in pakistan is worst of its kind and if it will not change, Economy of Pakistan will go down daily and Pakistan cannot become Fully developed country until the System and structure of Education is improved or totally changed. But as we see today in pakistan that the condition of schools and colleges of Govt. sector is worst as compared to Private schools and colleges, This is mainly due to the syllabus and the method of teaching in both Govt. and Private sector. We ourselves have created double standards for education like different education levels for different classes of people (i.e: middle class, lower class and upper class people), because lower class people could not afford such costly fees of private sectors. Today biggest problem in pakistan is that student doesn’t know what to do next in his life so he goes to undirected path and fails in life. There should be people for career counseling of children so that they could get to know that what they have to do in future. These people should be appointed in both Govt. and private sectors. Parents should also understand what a child wants to do in life and they should not impose their decisions on children. Lets suppose sometimes a child wants to be a doctor but parents try to impose that he should must become an engineer or sometimes Child wants to become an Engineer but parents impose that he should become Doctor. In such cases child loses his heart and stops hard work and passion in his studies and Try to start Cramming and at the end of the day he becomes a failed person. Govt. have to take specific steps to end cramming system in education from Govt. as well as Private sector and implement system of practical work, so that every student can gain more knowledge by doing research on that specific topic or subject, unlike “Ratta”(cramming) system where student have to memorize everything for short period of time which Teacher gives him/her. We are facing many problems in our Educational system due to different courses in different boards and Provinces. At first Govt. should implement same course and syllabus in all provinces and Boards to make sure that everyone gets same education. Secondly Govt should order Private as well as govt. schools and colleges to implement one syllabus in classes and there should be no double standards like implementing Oxford’s books in private sectors and Implementing Text Board’s books in Govt. sectors. Govt. should implement higher standards for choosing Teachers (i.e: at least M. Phil teachers) to make sure that they are teaching according to some standards. These are some of the major issues of the current education system of Pakistan, Lets hope for the better future of Education system in Pakistan. 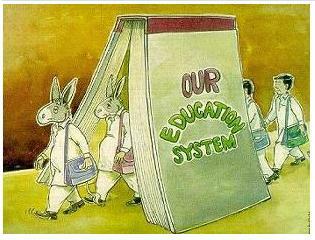 Please Share your views and suggestions about current education system in Pakistan. hmmm it should be improved then 7 % to 10% of the GDP. in my own view,govt should involve tchers in designing curriculum.they dont hv any idea of worst cond of education in rural areas,they design curriculum according to their own standards which didn’t match wid their needs.as a result,education system fails.so the need is to include primary tchers opinion in planning nd designing curriculum…. the policy developers just come with a printed document fetched by the foreign policies and without considering the conditions of Pakistan impose it on the Pakistani people. Dear Aliya and Ayesha, I do agree with you. American’s Think Tank have conducted a research and have highlighted that education system in Pakistan is only and only used for narrow political purposes. I have personally conducted a research here in the UK and noted serious gaps in Pakistani institutions. Although I have been in Pakistani institutions, however; once you go out of the country and study education system of the foresighted nations, then one can feel the real difference. However, in Pakistan, no one is serious about the issues. Even the Planning |Commission of Pakistan, who constitute nation’s future. A month ago, I have sent an email to Mr. Ahsan Iqbal, Federal Minister for Development / Chairman PCP, however; even he did not bother to respond my email at least.. So who is to blame. Pakistan ka Allah hi Hami ho. Nasir Ali, UK. Dear Nasir Ali sahib ! i fully agreed with your comets regarding education system in Pakistan. i belong from the most backward distt of Pakistan Kohistan. here is dozen schools are ghost, the school Peon/watchman is a king of whole school even he get per monthly from duty less teachers. the most girls schools specially used to HUJRA and Pet. the district and KP Govt still on way of sleeping. here is the literacy Rate of male eduction is bellow 5% and women eduction is less then 1%. The picture / cartoon portrayed in the above column really depict our system. I read the article n then comments of different people. Article is really applaudible and i believe that all this can be practicalized but the thing i want to add is, that govt will never be in favour of any such practical initiatives because it will go against prejudices of our heigher society. If educational system in our country becomes unanimous then people from lower society will become able to compete the upper echelons and will be problematic for them so they will never support any such cause bcoz they simply want to keep people slave of their evil intentions. Aslam o alaikum I read the article and comments by all of you…..this force me to write as well….. Lack of standard education is increasing day by day …..no one is serious about this issue…..in Pakistan 2% is denoted to education which is very less but the big phenomena is that this 2% goes in accounts of ministers…..this 2% is not properly utilized for education .teachers in interior areas are not devoted …..they just go once in a month to collect their salaries because there is no check and balance ……govt should concentrate on it other wise situation will grow more worse. I agree with almost all of your points, but I am not sure the figure you mentioned (2%) is true. I know that the Education commission of Pakistan are not focusing on these issues but we can’t just point out their mistake,majority of people try their best to do their paper by some help,by cheating and by giving money to teachers that’s not fair we should open our eyes that if there is something wrong in our society is just bcoz of us there is no mistake of our upcoming leaders ,they are also a countryman .We choose them for us .so i mean to say that our countrymen are going on the wrong side. AA I Think that we are not serious about education planning. ist we should improve quality of primary education then the foundation of learning will develop. Aslam o alaikum after reading all of your comments i agree with all of you..1st we should stand against any unfair,we should not wait for any one..no one will come to change our education system..we are the future of pakistan so lets holds hands together and do something. Uniform policies are essential for the betterment of the education in our country. Only enrollment doesn’t matter but quality education do matter. Just because of cramming our students are not creative and innovative. You are highlighting good points. Govt and private schools have to make unity their self. In my opinion remove private schools are educational institution. Bcz due to this govt institutions has lost their value . mostly teacher are teaching but they pass only their time and wast innocent children time the same time they spoil Pakistan’s bright future. but they don’t care. they have no any sorry feelings they are doing blander. In current days drugs is very big problem, please everyone need to think seriously why federal govt. not making law for each collage or university semester drugs test must need. if someone even thinking to use drugs he or she also think for drug test. i understand drug test not only one solution but it will reduce 90% sale of drugs to student also federal govt pass law death sentence for drugs suppliers. They killing our kids why we have mercy for them. Second in our rural area is big problem in lot of school there is not teacher available for every subject. so why school level education not convert in semester system. lot of parents not able to afford there kids study in city,if in there village there is no english teacher let kids come to get only english semester in city. please help them.